PHUKET: International competitors dominated the standings of The Bay Regatta, held last week, indicating its growing success on the Asian sailing calendar. Miss Saigon during The Bay Regatta last week. The third most common language spoken at this year’s regatta after English and Thai was Russian, with five Russian entries: Ruby Tuesday, Gastion and Ocean Agassi (all in the Racing Class), Creme Brulee aka Venture (in Bareboat Charter) and Uminoko (in Cruising A). “People think it’s only the King’s Cup that draws international competitors to Phuket, but that’s not the case,” said Scott Duncanson, owner and skipper of Quantum Fusion M, who finished up in third place in the Racing Class. Forty-three boats registered for the regatta this year, with 13 entering the Multihull division, making the Multihull class the largest ever contested in The Bay Regatta. The first-day course saw participants start off of Koh Rang through a course that saw them finish up at Koh Kudu, from where participants motored to the anchorage just off of Paradise Koh Yao Boutique Resort & Spa. 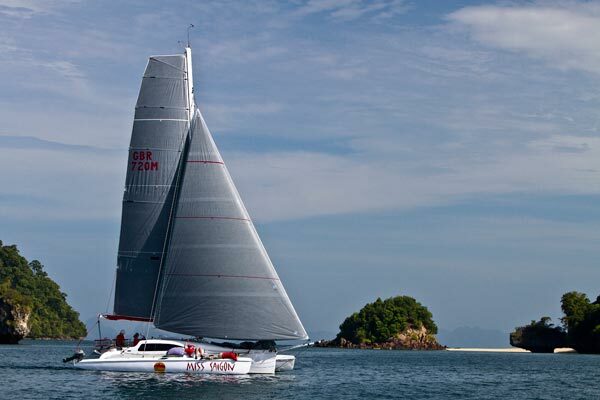 The fleet headed south towards Krabi on the second day of racing, sailing through the breathtaking limestone karsts of Phang Nga Bay. Day three saw sailors leave from the anchorage off the Sheraton Krabi Beach Resort just north of Ao Nang, only to return there for the evening’s party. On the fourth day, sunny skies and good wind brought the fleet back to Ao Chalong for the regatta’s final party and awards ceremony at the Ao Chalong Yacht Club (ACYC). With two first-place finishes and two second-place finishes Russian Arbuzov Andrev’s Ruby Tuesday captured the five-boat Racing Class with six points. Fellow countryman Nikiforov Evgenii’s Gastion came second on the strength of two seconds, a first and a third totalling eight points. And though Scott Duncanson’s Quantum Fusion flew through the water on the final day, winning with a day’s best of 2:06:53, its three third-place finishes in earlier races relegated it to third overall in the Racing Class. In the nine-boat Cruising A class Neils Degenkolw’s Phoenix took top honours on the strength of three first-place finishes and one second-spot placing, finishing with five points overall, the best score in the regatta. Degenkolw’s win gave him seven Bay Regatta victories placing him one behind Mark Pescott for the overall Bay Regatta win total. Jim Ellis’ Remington came second with eight points overall on one first, one second, and two third-place finishes. Richard Macfarlane’s Aida claimed third spot with eleven points, on three thirds and a second. Gavin Welman’s Rascal and Kevin Perran’s Rusalka tied for points with eleven each in the eight-boat Cruising B class. But Rascal won on countback finishing with two firsts, a fourth and a fifth. Rusalka had two seconds, a third and fourth place finish. Charlie Preen’s Seventh Heaven took third overall with thirteen points based on two fifths, a second and a first. The seven-boat Bareboat Charter division saw Kochnev Petr’s Tonicola 2 and Kozub Sergey’s Creme Brulee (aka Venture) tied with six points each as both had two first and two second-place finishes but Tonicola 2 won on countback. Paul Kendall’s Anchali was third overall with 14 points based on three thirds and a fifth-place finish. The 13-boat Multihull Class was won by Andrew Stransky’s Fantasia with two first-place finishes and two second-place finishes totalling six points. Second went to David Roberts’ boat DaVinci with a fourth, second and two third-place finishes for twelve points. Hans Rahmann’s Voodoo grabbed third with fifteen points, having a sixth, a first and two fourth-place finishes.